Today, I almost died. I practically sliced my finger off. CLEAN OFF THE BONE. Almost. It all started when I was making some bread. And I thought, "Hey, I'll put some melted butter in the dough. That'll be really nice." Psh. I thought it would be nice. So I took brick of butter out of the fridge and decided to cut it in half with a dinner knife. You may think that this was a perfectly normal course of action to take. Clearly, you have not met our new Ikea dinner knives. This thing is not a butter knife. This is not for cutting a tender piece of chicken. IT IS A HACKSAW, my friends. So, as you may know, butter is slippery. And as you also know, hacksaws can slice open your flesh. So anyways, the hacksaw just slid across the butter, right into my finger. And when I say into it, I mean, INTO it. Guess where those two horrible objects are now. THE TRASH. Now, as you may recall, I don't handle injuries well. So, as soon as it happened, I decided that the wisest thing to do was to staunch the flow of blood with my tongue, so I stuffed my fist in my mouth. Then I called to Tay, who was the only person in the room. "Tay, get me a bandaid. HURRY." And he was just kind of like, "Wha-? I can't hear what you're saying. Your hand is in your mouth. Oh, you want a bandaid? Here I'll get you one." "No, Tay! Not a Dora the Explorer one! I need something bigger. Give me that camo one at least, this is serious!" "What? I can't hear what you're saying." "I SAID, I NEED A BIG ONE!" I said, taking my fist out of my face and grabbing a paper towel to staunch the flow. "Ooo. That looks pretty bad. You better show Dad." "Okay, Yammie, let me see it." "You're gonna have to let go of it." "I CAN'T. I'M BLEEDING TO DEATH. I can tell I'm dying. It's just like in the movies." "Yammie, you're not gonna die. Just let me see it. I need to see if you need stitches." "STITCHES? If I need stitches will you do it? I can't go to the doctor. I HATE THE DOCTOR." "No, I don't have the right anesthetics. The stuff I use for teeth could kill the tissue in your finger." "I'M GOING TO HAVE TO GET IT AMPUTATED. It's already numb. I can't feel it at all!" "That's because you're squeezing it so hard. Now, just let go. Just for a second." "I CAN'T. IT'S GONNA FALL OFF. It's only hanging on by a THREAD." "Just let go. Come on. Just slowly let go. Slowly. Good job. There you go. Well, it doesn't look like you'll need stitches. Just keep pressure on it for a while and then I'll check it again." Well, as it turned out, Dora was as good as any old stitches. And after some whining and moaning I was fine. But as you may recall from the beginning of the story, I had been in the middle of making bread. And I also happened to be baking granola too. And if it weren't for this fine hero, both endeavors would have been lost. Doesn't the sight of a fifteen-year-old boy sifting flour just warm your soul? And I didn't even ask him to sift it! He did it all on his own! I was just going to have him dump it in. He even stirred my granola. What a sweetie. Go ahead fourteen-year-old girls, swoon if you must. Now, I am no longer a gluten person myself, but if you're here looking for a bread recipe, you are definitely a gluten person. Gluten is what gives your bread its structure and chewiness. You develop the gluten by adding liquid to the flour and then kneading it. I find that ten minutes of kneading in my stand mixer produces very strong strands of gluten as you can see in the photo above. I added a lot of yeast so that it would rise really fast, since I didn't want to be tied down by a bread schedule all day. Also, I forgot to add the salt in all the.... commotion. I think that sped up the process even more. Sugar helps the yeast grow faster, salt keeps it in check. That's life. I always try to remember to slice the top. It not only gives it that classic bread look, it also prevents the top from splitting. You want the crust to be able to form uninhibited without its rising insides bursting through it. If that makes sense. And don't worry about trying to make it perfectly smooth on top. Those imperfections can mesmerize even the staunchest haters of gluten. See what I mean? Beautiful, crispy, crunchy crust. Anywho, the texture of this bread was very nice on the inside too. Soft, pillowy, springy. I wouldn't mind a bed made out of this stuff. It would smell pretty awesome too. So, if you're scared of making bread, don't be. I don't know why everyone's always spreading all these lies about bread being so hard to make. I used to believe it too, but it's totally not true. And those lies have caused hundreds of children to grow up on Wonder bread, which really isn't so wonderful after all. Make this, and you'll never go back. Mix together the yeast, sugar, water, and oil. Let it sit for about five minutes. 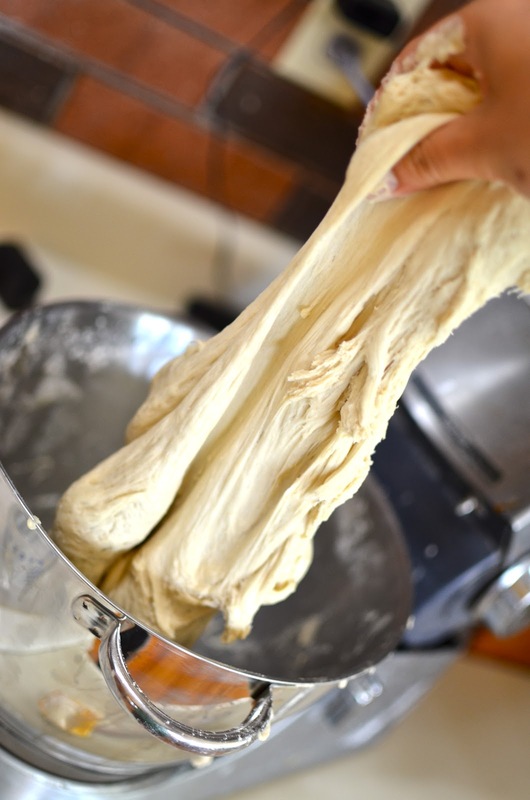 Add the flour a little and a time, mixing in your stand mixer with a dough hook. Add the salt. Knead for 10 minutes, in the stand mixer or by hand. Let the dough rise in a greased bowl (I used the same bowl). Spray or brush it with oil and let it rise 30 minutes or until doubled. Punch it down and form it into a log. Put it in a well-greased loaf pan and grease the top with spray. Preheat oven to 425ºF. Let the dough rise for about ten more minutes until it's pretty much doubled. Slice the top with a sharp bread knife or any serrated knife. Bake at 425º for about 10 minutes and then lower the heat to 350º and bake for 5-15 minutes more. You'll want the top to be very brown. When it's done it should slide easily out of your greased pan and it should sound hollow if you tap it. Allow to cool before cutting... if you can wait. And please... BE CAREFUL CUTTING IT. Follow on Facebook, Twitter, and Pinterest if you feel like it.